Everything about this seems dated, the treatment of animals, the macho posturing and the female roles, but it appears to have been popular at the time and must have been a feat to film. Great (if not politically correct) footage of East-African animals. Did that rhino really ram that jeep repeatedly?? The pre-CGI animal footage is impressive to watch. The story and the romance are not great. After 1/2 h of boring and very silly dialogues, I gave up this film. The hunting scenes were nice, but nothing impressive if compared to today's BBC or Discovery Channel's wildlife documentaries. An impressively shot adventure film, funny and exhilarating, featuring a strange international cast in a beautiful locale. It does overstay its welcome by quite a bit, though. It's a lot of great, lighthearted fun that brings to mind Hawks' other "hangout movies", namely Rio Bravo and Only Angels Have Wings. It's not as substantial as either of those, and the characters and situations aren't as well-drawn, but it's incredible how entertaining it is: awesome hunting scenes, obnoxiously cute romances, cool locations and animals, etc. Unfortunately it's waaay too long. 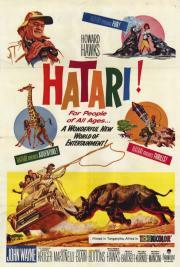 Despite the immense sense of menace -- the actors are really capturing these animals -- and adventure, Hatari! deserves credit for being another powerful, amusing and mesmerizing tale about a strange woman falling in love with a tough man, changing his life -- for the worst and for the best --, but being the leading person in this relationship -- she's one that has to do something, says Pockets. Those three elephants chasing Dallas are just mesmerizing. I think that Hatari! is what cinema is all about. The testimonial of Hawks to us. Two and a half hours out in Africa, chasing animals with Wayne and his international cast of misfits. Nothing much happens, so it pretty much relies on how much you enjoy hanging out with them, listening to some occasionally witty banter and spying on some childish romance plots. It's never bad, but I can't say I cared much about anything that happens in it. At a shorter length it would be a good way to pass the time, but well over two hours is pushing it. Horrible dialogues, mostly bad acting, no scipt whatsoever, just goes on and on and. Even when You focus on the pleasant aspect... ups, sorry, there is none! Bunch of cocky guys capturing wild animals for profit... I like Wayne and Hawks, but I have to say, that this STINKS !!! Not a whole lot happens in the two and a half hour running time. Elephant shenanigans help make this a likable film. There isn't much of a plot, it's more a series of anecdotes. Some exciting, some funny, some cute. Some of the hunting scenes are well done, and there's some of that terrific Hawks banter. But a lot of it just feels goofy, and the Mancini score doesn't help. All it takes are a few lame sight gags or slapstick segments to ruin it, and there's more than a few. Overall it just didn't strike the right tone with me, too cutesy and flippant and dare I say wholesome, but there are some nice moments. See it for John Wayne with a bird cage on his head if for nothing else! The first couple hours are full of macho swaggering but the last 20 minutes is a cuteness explosion with 3 baby elephants chasing the beautiful Elsa Martinelli around town. A 150-minute vacation in Africa with John Wayne and Red Buttons. In a word, awesome.